BIM-COINS is a crypto-system dedicated to real estate projects, in the thinking of BIM (Building Information Modelling) to build, manage and finance the world’s innovative real estate opportunities. Using blockchain technology, the BIM-COINS platform allows all stakeholders in a real estate project plan, finance, buy and sell unique projects, tokenize them, and offer them as curated investment opportunities. From rental properties to new developments, tokenized investments will be governed by an escrow-backed trust, providing security to high-yield investment projects. Plan. Finance. Design. Build. Manage. New technology is transforming the way AEC (Architecture, Engineering & Construction) projects are designed, engineered, built and managed – delivering greater ROI for firms of all sizes and all stakeholders of the project. 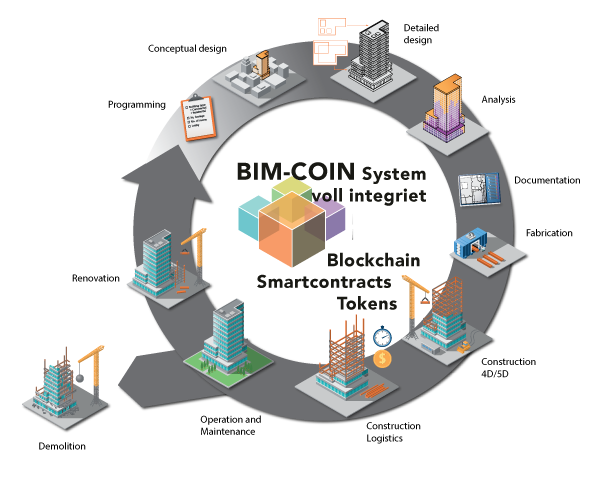 Implementing BIM (Building Information Modelling) and BIM-Coins Blockchain System can deliver business benefits whether you’re designing sustainable houses or reimagining the infrastructure of entire cities. The Integrated BIM-Coin Tools for building design, civil infrastructure and construction gives you access to a set of integrated tools and powerful workflows so you can deliver your best work and stay competitive. Cloud-computing will have a much more significant impact upon how the built environment is managed than 3D visualization. Information drives cost savings and higher efficiency. How and when we access information will forever alter day-to-day and strategic business practices for Owners, AEs, Contractors, SubContractors, Business Product Manufacturers, Building Users, Oversight Groups, and the Community. If you want to invest or interested in more information, just contact us and we will send you the BIM-Cons white paper in English or German.